As the title suggests, more than a war book. However as the Fall of Rabaul to the Japanese, January 1942, played such a central part in that history, so it does in Masked Eden. Unlike other recent authors on the subject, Anne McCosker was born in Rabaul of Australian pioneering parents. The Fall of Rabaul was a personal tragedy for her family and their friends of all races. Primary source material from family correspondence and archives, published undistorted in full for the first time, shows what an unnecessary disaster was the capture of that strategic capital of the Mandated Territory of New Guinea. 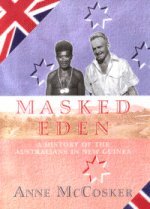 Masked Eden details how close were the ties between many of the New Guineans and the Australians pre WWII. Rombin, Stan McCosker's boss boy and friend, for example, was to rescue, and hide from nearby Japanese, an American airman for many months. He then led him and another American to safety with A.I.B. (Allied Intelligence Bureau) Officers, remaining to fight with them. With the support of such New Guineans, the pre-war residents of the Islands could, if backed by their own Australian Government, at least have delayed the Fall of Rabaul. As it was, the military garrison and many of the civilians disappeared during the war, the manner of their death remaining a mystery in spite of Officialdoms attempts to place most of them on one ship, the' Montevideo Maru'. Masked Eden tells of Stan McCosker's escape from Rabaul to Australia, he was one of the last Europeans to do so. His full six page REPORT of Rabaul's fall is published as is the letter written by his wife telling of his escape. Rombin's exploits during the war, taken - unaltered - from archival material and first hand information, are also published. Anne McCosker's uncle and Godfather was captured at Singapore. Having survived Changi and the Burma Railway, he died in Queensland in his late eighties. Extracts from his diary are published in Masked Eden. The book also gives names and faces to some of the pre-WWII Europeans, those civilians, 'hostages to fortune' captured by the Japanese in New Guinea, men, either forgotten except by their families, or denigrated by modern writers. How to purchase Masked Eden In the UKPrice £28 from all good bookshops By postMatala PressPO Box 829MalenyQueensland 4552Australia.